THOMASVILLE — Thomasville Bulldogs soon will be able to dig their paws into artificial turf. 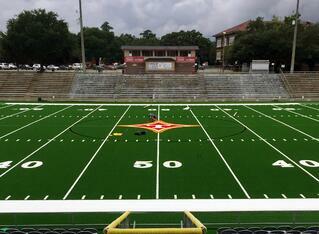 Installation of synthetic turf for Veterans Memorial Stadium began Wednesday. The turf, an AstroTurf product, is a mixture of monofilament and slit film fibers, said Megan Roberts, sales and marketing representative for SportsTurf Company, the Whitesburg company installing the turf. “They’re getting a blended fiber,” Roberts said of the artificial turf. The slit film is more durable and the monofilament is more aesthetic-centered, Roberts said. The new field also will be equipped with a root zone to eliminate the rubber infill from coming undone, along with a material called “zeofill.”“It actually brings the temperature down,” Roberts said of the material. Zeofill, Roberts said, is a mineral that absorbs 81 percent of its weight in water and then slowly releases the water to cool off the field, up to 30 degrees cooler. Protective padding also will be installed underneath the artificial turf, a new trend for similar fields and for safety reasons, Roberts noted. The city schools “diamond T” logo will adorn the 50-yard line and “Bulldogs” in school colors will be displayed at each field end zone. Installation is set to take two weeks. Post installation, “maintenance is pretty simple,” Roberts said. Grooming the field to redistribute the infill and to remove any debris will be conducted during high-traffic months. City Schools Director of Operations Hank Townsend updated the school board on the progress at Veterans Stadium on Tuesday afternoon. The projected deadline for completion, Townsend said, is Aug. 9, two days before the August scrimmage game against the Pelham High School Hornets. “We expect a lot of people to be at that scrimmage,” Townsend said. City school officials have said the turf will have an eight-year warranty and estimated the turf to last 10-13 years before replacing the turf. A total of $1.65 million in special purpose local options sales tax (SPLOST) funds has been designated for the stadium project, which is set to take place in two phases. The second phase, which includes work to the press boxes, entry way, and ticket booth, is separated into two smaller phases.